Ertmer, P. A., & Newby, T. J. (2013). Behaviorism, cognitivism, constructivism: Comparing critical features from an instructional design perspective. Performance Improvement Quarterly, 26(2), 43-71. The need for a bridge between basic learning research and educational practice has long been discussed. To ensure a strong connection between these two areas, Dewey (cited in Reigeluth, 1983) called for the creation and development of a “linking science”; Tyler (1978) a “middleman position”; and Lynch (1945) for employing an “engineering analogy” as an aid for translating theory into practice. In each case, the respective author highlighted the information and potential contributions of available learning theories, the pressing problems faced by those dealing with practical learning issues, and a general lack of using the former to facilitate solutions for the latter. The value of such a bridging function would be its ability to translate relevant aspects of the learning theories into optimal instructional actions. As described by Reigeluth (1983, p. 5), the field of Instructional Design performs this role. Instructional designers have been charged with “translating principles of learning and instruction into specifications for instructional materials and activities” (Smith & Ragan, 1993, p. 12). To achieve this goal, two sets of skills and knowledge are needed. First, the designer must understand the position of the practitioner. In this regard, the following questions would be relevant: What are the situational and contextual constraints of the application? What is the degree of individual differences among the learners? What form of solutions will or will not be accepted by the learners as well as by those actually teaching the materials? The designer must have the ability to diagnose and analyze practical learning problems. Just as a doctor cannot prescribe an effective remedy without a proper diagnosis, the instructional designer cannot properly recommend an effective prescriptive solution without an accurate analysis of the instructional problem. In addition to understanding and analyzing the problem, a second core of knowledge and skills is needed to “bridge” or “link” application with research–that of understanding the potential sources of solutions (i.e., the theories of human learning). Through this understanding, a proper prescriptive solution can be matched with a given diagnosed problem. The critical link, therefore, is not between the design of instruction and an autonomous body of knowledge about instructional phenomena, but between instructional design issues and the theories of human learning. The task of translating learning theory into practical applications would be greatly simplified if the learning process were relatively simple and straightforward. Unfortunately, this is not the case. Learning is a complex process that has generated numerous interpretations and theories of how it is effectively accomplished. Of these many theories, which should receive the attention of the instructional designer? Is it better to choose one theory when designing instruction or to draw ideas from different theories? This article presents three distinct perspectives of the learning process (behavioral, cognitive, and constructivist) and although each has many unique features, it is our belief that each still describes the same phenomena (learning). In selecting the theory whose associated instructional strategies offers the optimal means for achieving desired outcomes, the degree of cognitive processing required of the learner by the specific task appears to be a critical factor. Therefore, as emphasized by Snelbecker (1983), individuals addressing practical Iearning problems cannot afford the “luxury of restricting themselves to only one theoretical position… [They] are urged to examine each of the basic science theories which have been developed by psychologists in the study of learning and to select those principles and conceptions which seem to be of value for one’s particular educational situation’ (p. 8). If knowledge of the various learning theories is so important for instructional designers, to what degree are they emphasized and promoted? As reported by Johnson (1992), less than two percent of the courses offered in university curricula in the general area of educational technology emphasize “theory” as one of their key concepts. It appears that the real benefits of theoretical knowledge are, at present, not being realized. This article is an attempt to “fill in some of the gaps” that may exist in our knowledge of modern learning theories. The main intent is to provide designers with some familiarity with three relevant positions on learning (behavioral, cognitive, and constructivist) which should provide a more structured foundation for planning and conducting instructional design activities. The idea is that if we understand some of the deep principles of the theories of learning, we can extrapolate to the particulars as needed. As Bruner (1971) states, “You don’t need to encounter everything in nature in order to know nature” (p. 18). A basic understanding of the learning theories can provide you with a “canny strategy whereby you could know a great deal about a lot of things while keeping very little in mind” (p. 18). It is expected that after reading this article, instructional designers and educational practitioners should be better informed “consumers”of the strategies suggested by each viewpoint. The concise information presented here can serve as an initial base of knowledge for making important decisions regarding instructional objectives and strategies. Learning has been defined in numerous ways by many different theorists, researchers and educational practitioners. Although universal agreement on any single definition is nonexistent, many definitions employ common elements. The following definition by Shuell (as interpreted by Schunk, 1991) incorporates these main ideas: “Learning is an enduring change in behavior, or in the capacity to behave in a given fashion, which results from practice or other forms of experience” (p. 2). What types of learning are best explained by the theory? How should instruction be structured to facilitate learning? In this article, each of these questions is answered from three distinct viewpoints: behaviorism, cognitivism, and constructivism. Although learning theories typically are divided into two categories–behavioral and cognitive–a third category, constructive, is added here because of its recent emphasis in the instructional design literature (e.g., Bednar, Cunningham, Duffy, & Perry, 1991; Duffy & Jonassen, 1991; Jonassen, 1991b; Winn, 1991). In many ways these viewpoints overlap; yet they are distinctive enough to be treated as separate approaches to understanding and describing learning. These three particular positions were chosen because of their importance, both historically and currently, to the field of instructional design. It is hoped that the answers to the first five questions will provide the reader with a basic understanding of how these viewpoints differ. The answers to the last two questions will translate these differences into practical suggestions and recommendations for the application of these principles in the design of instruction. These seven questions provide the basis for the article’s structure. For each of the three theoretical positions, the questions are addressed and an example is given to illustrate the application of that perspective. It is expected that this approach will enable the reader to compare and contrast the different viewpoints on each of the seven issues. As is common in any attempt to compare and contrast similar products, processes, or ideas, differences are emphasized in order to make distinctions clear. This is not to suggest that there are no similarities among these viewpoints or that there are no overlapping features. In fact, different learning theories will often prescribe the same instructional methods for the same situations (only with different terminology and possibly with different intentions). This article outlines the major differences between the three positions in an attempt to facilitate comparison. It is our hope that the reader will gain greater insight into what each viewpoint offers in terms of the design and presentation of materials, as well as the types of learning activities that might be prescribed. Current learning theories have roots that extend far into the past. The problems with which today’s theorists and researchers grapple and struggle are not new but simply variations on a timeless theme: Where does knowledge come from and how do people come to know? Two opposing positions on the origins of knowledge-empiricism and rationalism have existed for centuries and are still evident, to varying degrees, in the learning theories of today. A brief description of these views is included here as a background for comparing the “modern” learning viewpoints of behaviorism, cognitivism, and constructivism. Empiricism is the view that experience is the primary source of knowledge (Schunk, 1991). That is, organisms are born with basically no knowledge and anything learned is gained through interactions and associations with the environment. Beginning with Aristotle (384-322 B.C. ), empiricists have espoused the view that knowledge is derived from sensory impressions. Those impressions, when associated contiguously in time and/or space, can be hooked together to form complex ideas. For example, the complex idea of a tree, as illustrated by Hulse, Egeth, and Deese (1980), can be built from the less complex ideas of branches and leaves, which in turn are built from the ideas of wood and fiber, which are built from basic sensations such as greenness, woody odor, and so forth. From this perspective, critical instructional design issues focus on how to manipulate the environment in order to improve and ensure the occurrence of proper associations. Rationalism is the view that knowledge derives from reason without the aid of the senses (Schunk, 1991). This fundamental belief in the distinction between mind and matter originated with Plato (c. 427-347 B.C. ), and is reflected in the viewpoint that humans learn by recalling or “discovering” what already exists in the mind. For example, the direct experience with a tree during one’s lifetime simply serves to reveal that which is already in the mind. The “real” nature of the tree (greenness, woodiness, and other characteristics) becomes known, not through the experience, but through a reflection on one’s idea about the given instance of a tree. Although later rationalists differed on some of Plato’s other ideas, the central belief remained the same: that knowledge arises through the mind. From this perspective, instructional design issues focus on how best to structure new information in order to facilitate (1) the learners’ encoding of this new information, as well as (2) the recalling of that which is already known. The empiricist, or associationist, mindset provided the framework for many learning theories during the first half of this century, and it was against this background that behaviorism became the leading psychological viewpoint (Schunk, 1991). Because behaviorism was dominant when instructional theory was initiated (around 1950), the instructional design (ID) technology that arose alongside it was naturally influenced by many of its basic assumptions and characteristics. Since ID has its roots in behavioral theory, it seems appropriate that we turn our attention to behaviorism first. Behaviorism equates learning with changes in either the form or frequency of observable performance. Learning is accomplished when a proper response is demonstrated following the presentation of a specific environmental stimulus. For example, when presented with a math flashcard showing the equation “2 + 4 = ?” the learner replies with the answer of “6.” The equation is the stimulus and the proper answer is the associated response. The key elements are the stimulus, the response, and the association between the two. Of primary concern is how the association between the stimulus and response is made, strengthened, and maintained. Behaviorism focuses on the importance of the consequences of those performances and contends that responses that are followed by reinforcement are more likely to recur in the future. No attempt is made to determine the structure of a student’s knowledge nor to assess which mental processes it is necessary for them to use (Winn, 1990). The learner is characterized as being reactive to conditions in the environment as opposed to taking an active role in discovering the environment. Although both learner and environmental factors are considered important by behaviorists, environmental conditions receive the greatest emphasis. Behaviorists assess the learners to determine at what point to begin instruction as well as to determine which reinforcers are most effective for a particular student. The most critical factor, however, is the arrangement of stimuli and consequences within the environment. Memory, as commonly defined by the layman, is not typically addressed by behaviorists. Although the acquisition of “habits” is discussed, little attention is given as to how these habits are stored or recalled for future use. Forgetting is attributed to the “nonuse” of a response over time. The use of periodic practice or review serves to maintain a learner’s readiness to respond (Schunk, 1991). Transfer refers to the application of learned knowledge in new ways or situations, as well as to how prior learning affects new learning. In behavioral learning theories, transfer is a result of generalization. Situations involving identical or similar features allow behaviors to transfer across common elements. For example, the student who has learned to recognize and classify elm trees demonstrates transfer when (s)he classifies maple trees using the same process. The similarities between the elm and maple trees allow the learner to apply the previous elm tree classification learning experience to the maple tree classification task. What Types of Learning Are Best Explained by This Position? Behaviorists attempt to prescribe strategies that are most useful for building and strengthening stimulus-response associations (Winn, 1990), including the use of instructional cues, practice, and reinforcement. These prescriptions have generally been proven reliable and effective in facilitating learning that involves discriminations (recalling facts), generalizations (defining and illustrating concepts), associations (applying explanations), and chaining (automatically performing a specified procedure). However, it is generally agreed that behavioral principles cannot adequately explain the acquisition of higher level skills or those that require a greater depth of processing (e.g., language development, problem solving, inference generating, critical thinking) (Schunk, 1991). What Basic Assumptions/principles of This Theory Are Relevant to Instructional Design? Many of the basic assumptions and characteristics of behaviorism are embedded in current instructional design practices. Behaviorism was used as the basis for designing many of the early audio-visual materials and gave rise to many related teaching strategies, such as Skinner’s teaching machines and programmed texts. More recent examples include principles utilized within computer-assisted instruction (CAI) and mastery learning. The goal of instruction for the behaviorist is to elicit the desired response from the learner who is presented with a target stimulus. To accomplish this, the learner must know how to execute the proper response, as well as the conditions under which that response should be made. Therefore, instruction is structured around the presentation of the target stimulus and the provision of opportunities for the learner to practice making the proper response. To facilitate the linking of stimulus-response pairs, instruction frequently uses cues (to initially prompt the delivery of the response) and reinforcement (to strengthen correct responding in the presence of the target stimulus). Behavioral theories imply that the job of the teacher/designer is to (1) determine which cues can elicit the desired responses; (2) arrange practice situations in which prompts are paired with the target stimuli that initially have no eliciting power but which will be expected to elicit the responses in the “natural” (performance) setting; and (3) arrange environmental conditions so that students can make the correct responses in the presence of those target stimuli and receive reinforcement for those responses (Gropper, 1987). For example, a newly-hired manager of human resources may be expected to organize a meeting agenda according to the company’s specific format. The target stimulus (the verbal command “to format a meeting agenda”) does not initially elicit the correct response nor does the new manager have the capability to make the correct response. However, with the repeated presentation of cues (e.g., completed templates of past agendas, blank templates arranged in standard format) paired with the verbal command stimulus, the manager begins to make the appropriate responses. Although the initial responses may not be in the final proper form, repeated practice and reinforcement shape the response until it is correctly executed. FinaIIy, learning is demonstrated when, upon the command to format a meeting agenda, the manager reliably organizes the agenda according to company standards and does so without the use of previous examples or models. In the late 1950’s, learning theory began to make a shift away from the use of behavioral models to an approach that relied on learning theories and models from the cognitive sciences. Psychologists and educators began to de-emphasize a concern with overt, observable behavior and stressed instead more complex cognitive processes such as thinking, problem solving, language, concept formation and information processing (Snelbecker, 1983). Within the past decade, a number of authors in the field of instructional design have openly and consciously rejected many of ID’s traditional behavioristic assumptions in favor of a new set of psychological assumptions about learning drawn from the cognitive sciences. Whether viewed as an open revolution or simply a gradual evolutionary process, there seems to be the general acknowledgment that cognitive theory has moved to the forefront of current learning theories (Bednar et al., 1991). This shift from a behavioral orientation (where the emphasis is on promoting a student’s overt performance by the manipulation of stimulus material) to a cognitive orientation (where the emphasis is on promoting mental processing) has created a similar shift from procedures for manipulating the materials to be presented by an instructional system to procedures for directing student processing and interaction with the instructional design system (Merrill, Kowalis, & Wilson, 1981). Cognitive theories stress the acquisition of knowledge and internal mental structures and, as such, are closer to the rationalist end of the epistemology continuum (Bower & Hilgard, 1981). Learning is equated with discrete changes between states of knowledge rather than with changes in the probability of response. Cognitive theories focus on the conceptualization of students’ learning processes and address the issues of how information is received, organized, stored, and retrieved by the mind. Learning is concerned not so much with what learners do but with what they know and how they come to acquire it (Jonassen, 1991b). Knowledge acquisition is described as a mental activity that entails internal coding and structuring by the learner. The learner is viewed as a very active participant in the learning process. Cognitivism, like behaviorism, emphasizes the role that environmental conditions play in facilitating learning. Instructional explanations, demonstrations, illustrative examples and matched non-examples are all considered to be instrumental in guiding student learning. Similarly, emphasis is placed on the role of practice with corrective feedback. Up to this point, little difference can be detected between these two theories. However, the “active” nature of the learner is perceived quite differently. The cognitive approach focuses on the mental activities of the learner that lead up to a response and acknowledges the processes of mental planning, goal-setting, and organizational strategies (Shuell, 1986). Cognitive theories contend that environmental “cues” and instructional components alone cannot account for all the learning that results from an instructional situation. Additional key elements include the way that learners attend to, code, transform, rehearse, store and retrieve information. Learners’ thoughts, beliefs, attitudes, and values are also considered to be influential in the learning process (Winne, 1985). The real focus of the cognitive approach is on changing the learner by encouraging him/her to use appropriate learning strategies. As indicated above, memory is given a prominent role in the learning process. Learning results when information is stored in memory in an organized, meaningful manner. Teachers/designers are responsible for assisting learners in organizing that information in some optimal way. Designers use techniques such as advance organizers, analogies, hierarchical relationships, and matrices to help learners relate new information to prior knowledge. Forgetting is the inability to retrieve information from memory because of interference, memory loss, or missing or inadequate cues needed to access information. According to cognitive theories, transfer is a function of how information is stored in memory (Schunk, 1991). When a learner understands how to apply knowledge in different contexts, then transfer has occurred. Understanding is seen as being composed of a knowledge base in the form of rules, concepts, and discriminations (Duffy & Jonassen, 1991). Prior knowledge is used to establish boundary constraints for identifying the similarities and differences of novel information. Not only must the knowledge itself be stored in memory but the uses of that knowledge as well. Specific instructional or real-world events will trigger particular responses, but the learner must believe that the knowledge is useful in a given situation before he will activate it. Because of the emphasis on mental structures, cognitive theories are usually considered more appropriate for explaining complex forms of learning (reasoning, problem-solving, information-processing) than are those of a more behavioral perspective (Schunk, 1991). However, it is important to indicate at this point that the actual goal of instruction for both of these viewpoints is often the same: to communicate or transfer knowledge to the students in the most efficient, effective manner possible (Bednar et al., 1991). Two techniques used by both camps in achieving this effectiveness and efficiency of knowledge transfer are simplification and standardization. That is, knowledge can be analyzed, decomposed, and simplified into basic building blocks. Knowledge transfer is expedited if irrelevant information is eliminated. For example, trainees attending a workshop on effective management skills would be presented with information that is “sized” and “chunked” in such a way that they can assimilate and/or accommodate the new information as quickly and as easily as possible. Behaviorists would focus on the design of the environment to optimize that transfer, while cognitivists would stress efficient processing strategies. Many of the instructional strategies advocated and utilized by cognitivists are also emphasized by behaviorists, yet usually for different reasons. An obvious commonality is the use of feedback. A behaviorist uses feedback (reinforcement) to modify behavior in the desired direction, while cognitivists make use of feedback (knowledge of results) to guide and support accurate mental connections (Thompson, Simonson, & Hargrave, 1992). Learner and task analyses are also critical to both cognitivists and behaviorists, but once again, for different reasons. Cognitivists look at the learner to determine his/her predisposition to learning (i.e., How does the learner activate, maintain, and direct his/her learning?) (Thompson et al., 1992). Additionally, cognitivists examine the learner to determine how to design instruction so that it can be readily assimilated (i.e., What are the learner’s existing mental structures?). In contrast, the behaviorists look at learners to determine where the lesson should begin (i.e., At what level are they currently performing successfully?) and which reinforcers should be most effective (i.e., What consequences are most desired by the learner?). Behavioral theories imply that teachers ought to arrange environmental conditions so that students respond properly to presented stimuli. Cognitive theories emphasize making knowledge meaningful and helping learners organize and relate new information to existing knowledge in memory. Instruction must be based on a student’s existing mental structures, or schema, to be effective. It should organize information in such a manner that learners are able to connect new information with existing knowledge in some meaningful way. Analogies and metaphors are examples of this type of cognitive strategy. For example, instructional design textbooks frequently draw an analogy between the familiar architect’s profession and the unfamiliar instructional design profession to help the novice learner conceptualize, organize and retain the major duties and functions of an instructional designer (e.g. Reigeluth, 1983, p. 7). Other cognitive strategies may include the use of framing, outlining, mnemonics, concept mapping, advance organizers and so forth (West, Farmer, & Wolff, 1991). Such cognitive emphases imply that major tasks of the teacher/designer include (1) understanding that individuals bring various learning experiences to the learning situation which can impact learning outcomes; (2) determining the most effective manner in which to organize and structure new information to tap the learners’ previously acquired knowledge, abilities, and experiences; and (3) arranging practice with feedback so that the new information is effectively and efficiently assimilated and/or accommodated within the learner’s cognitive structure (Stepich & Newby, 1988). Consider the following example of a learning situation utilizing a cognitive approach: A manager in the training department of a large corporation had been asked to teach a new intern to complete a cost-benefit analysis for an upcoming development project. In this case, it is assumed that the intern has no previous experience with cost-benefit analysis in a business setting. However, by relating this new task to highly similar procedures with which the intern has had more experience, the manager can facilitate a smooth and efficient assimilation of this new procedure into memory. These familiar procedures may include the process by which the individual allocates his monthly paycheck, how (s)he makes a buy/no-buy decision regarding the purchase of a luxury item, or even how one’s weekend spending activities might be determined and prioritized. The procedures for such activities may not exactly match those of the cost-benefit analysis, but the similarity between the activities allows for the unfamiliar information to be put within a familiar context. Thus processing requirements are reduced and the potential effectiveness of recall cues is increased. The philosophical assumptions underlying both the behavioral and cognitive theories are primarily objectivistic; that is: the world is real, external to the learner. The goal of instruction is to map the structure of the world onto the learner (Jonassen, 1991b). A number of contemporary cognitive theorists have begun to question this basic objectivistic assumption and are starting to adopt a more constructivist approach to learning and understanding: knowledge “is a function of how the individual creates meaning from his or her own experiences” (p.10). Constructivism is not a totally new approach to learning. Like most other learning theories, constructivism has multiple roots in the philosophical and psychological viewpoints of this century, specifically in the works of Piaget, Bruner, and Goodman (Perkins, 1991). In recent years, however, constructivism has become a “hot” issue as it has begun to receive increased attention in a number of different disciplines, including instructional design (Bednar et al., 1991). Constructivism is a theory that equates learning with creating meaning from experience (Bednar et al., 1991). Even though constructivism is considered to be a branch of cognitivism (both conceive of learning as a mental activity), it distinguishes itself from traditional cognitive theories in a number of ways. Most cognitive psychologists think of the mind as a reference tool to the real world; constructivists believe that the mind filters input from the world to produce its own unique reaIity (Jonassen, 1991a). Like with the rationalists of Plato’s time, the mind is believed to be the source of all meaning, yet like the empiricists, individual, direct experiences with the environment are considered critical. Constructivism crosses both categories by emphasizing the interaction between these two variables. Constructivists do not share with cognitivists and behaviorists the belief that knowledge is mind-independent and can be “mapped” onto a learner. Constructivists do not deny the existence of the real world but contend that what we know of the world stems from our own interpretations of our experiences. Humans create meaning as opposed to acquiring it. Since there are many possible meanings to glean from any experience, we cannot achieve a predetermined, “correct” meaning. Learners do not transfer knowledge from the external world into their memories; rather they build personal interpretations of the world based on individual experiences and interactions. Thus, the internal representation of knowledge is constantly open to change; there is not an objective reality that learners strive to know. Knowledge emerges in contexts within which it is relevant. Therefore, in order to understand the learning which has taken place within an individual, the actual experience must be examined (Bednar et al., 1991). Both learner and environmental factors are critical to the constructivist, as it is the specific interaction between these two variables that creates knowledge. Constructivists argue that behavior is situationally determined (Jonassen, 1991a). Just as the learning of new vocabulary words is enhanced by exposure and subsequent interaction with those words in context (as opposed to learning their meanings from a dictionary), likewise it is essential that content knowledge be embedded in the situation in which it is used. Brown, Collins, and Duguid (1989) suggest that situations actually co-produce knowledge (along with cognition) through activity. Every action is viewed as “an interpretation of the current situation based on an entire history of previous interactions” (Clancey, 1986). Just as shades of meanings of given words are constantly changing a learner’s “current” understanding of a word, so too will concepts continually evolve with each new use. For this reason, it is critical that learning occur in realistic settings and that the selected learning tasks be relevant to the students’ lived experience. The goal of instruction is not to ensure that individuals know particular facts but rather that they elaborate on and interpret information. “Understanding is developed through continued, situated use … and does not crystallize into a categorical definition” that can be called up from memory (Brown et al., 1989, p. 33). As mentioned earlier, a concept will continue to evolve with each new use as new situations, negotiations, and activities recast it in a different, more densely textured form. Therefore, “memory” is always under construction as a cumulative history of interactions. Representations of experiences are not formalized or structured into a single piece of declarative knowledge and then stored in the head. The emphasis is not on retrieving intact knowledge structures, but on providing learners with the means to create novel and situation-specific understandings by “assembling” prior knowledge from diverse sources appropriate to the problem at hand. For example, the knowledge of “design” activities has to be used by a practitioner in too many different ways for them all to be anticipated in advance. Constructivists emphasize the flexible use of pre-existing knowledge rather than the recall of prepackaged schemas (Spiro, Feltovich, Jacobson, & Coulson, 1991). Mental representations developed through task-engagement are likely to increase the efficiency with which subsequent tasks are performed to the extent that parts of the environment remain the same: “Recurring features of the environment may thus afford recurring sequences of actions” (Brown et al., p. 37). Memory is not a context-independent process. Clearly the focus of constructivism is on creating cognitive tools which reflect the wisdom of the culture in which they are used as well as the insights and experiences of individuals. There is no need for the mere acquisition of fixed, abstract, self-contained concepts or details. To be successful, meaningful, and lasting, learning must include all three of these crucial factors: activity (practice), concept (knowledge), and culture (context) (Brown et al., 1989). The constructivist position assumes that transfer can be facilitated by involvement in authentic tasks anchored in meaningful contexts. Since understanding is “indexed” by experience (just as word meanings are tied to specific instances of use), the authenticity of the experience becomes critical to the individual’s ability to use ideas (Brown et al., 1989). An essential concept in the constructivist view is that learning always takes place in a context and that the context forms an inexorable link with the knowledge embedded in it (Bednar et al., 1991). Therefore, the goal of instruction is to accurately portray tasks, not to define the structure of learning required to achieve a task. If learning is decontextualized, there is little hope for transfer to occur. One does not learn to use a set of tools simply by following a list of rules. Appropriate and effective use comes from engaging the learner in the actual use of the tools in real-world situations. Thus, the ultimate measure of learning is based on how effective the learner’s knowledge structure is in facilitating thinking and performing in the system in which those tools are used. The constructivist view does not accept the assumption that types of learning can be identified independent of the content and the context of learning (Bednar et al., 1991). Constructivists believe that it is impossible to isolate units of information or divide up knowledge domains according to a hierarchical analysis of relationships. Although the emphasis on performance and instruction has proven effective in teaching basic skills in relatively structured knowledge domains, much of what needs to be learned involves advanced knowledge in ill-structured domains. Jonassen (1991a) has described three stages of knowledge acquisition (introductory, advanced, and expert) and argues that constructive learning environments are most effective for the stage of advanced knowledge acquisition, where initial misconceptions and biases acquired during the introductory stage can be discovered, negotiated, and if necessary, modified and/or removed. Jonassen agrees that introductory knowledge acquisition is better supported by more objectivistic approaches (behavioral and/or cognitive) but suggests a transition to constructivistic approaches as learners acquire more knowledge which provides them with the conceptual power needed to deal with complex and ill-structured problems. The constructivist designer specifies instructional methods and strategies that will assist learners in actively exploring complex topics/environments and that will move them into thinking in a given content area as an expert user of that domain might think. Knowledge is not abstract but is linked to the context under study and to the experiences that the participants bring to the context. As such, learners are encouraged to construct their own understandings and then to validate, through social negotiation, these new perspectives. Content is not prespecified; information from many sources is essential. For example, a typical constructivist’s goal would not be to teach novice ID students straight facts about instructional design, but to prepare students to use ID facts as an instructional designer might use them. As such, performance objectives are not related so much to the content as they are to the processes of construction. Some of the specific strategies utilized by constructivists include situating tasks in real-world contexts, use of cognitive apprenticeships (modeling and coaching a student toward expert performance), presentation of multiple perspectives (collaborative learning to develop and share alternative views), social negotiation (debate, discussion, evidencegiving), use of examples as real “slices of life,” reflective awareness, and providing considerable guidance on the use of constructive processes. An emphasis on the identification of the context in which the skills will be learned and subsequently applied [anchoring learning in meaningful contexts]. An emphasis on learner control and the capability of the learner to manipulate information [actively using what is learned]. The need for information to be presented in a variety of different ways [revisiting content at different times, in rearranged contexts, for different purposes, and from different conceptual perspectives]. Supporting the use of problem-solving skills that allow learners to go “beyond the information given.” [developing pattern-recognition skills, presenting alternative ways of representing problems]. Assessment focused on transfer of knowledge and skills [presenting new problems and situations that differ from the conditions of the initial instruction]. As one moves along the behaviorist-cognitivist-constructivist continuum, the focus of instruction shifts from teaching to learning, from the passive transfer of facts and routines to the active application of ideas to problems. Both cognitivists and constructivists view the learner as being actively involved in the learning process, yet the constructivists look at the learner as more than just an active processor of information; the learner elaborates upon and interprets the given information (Duffy & Jonassen, 1991). Meaning is created by the learner: learning objectives are not pre-specified nor is instruction predesigned. “The role of instruction in the constructivist view is to show students how to construct knowledge, to promote collaboration with others to show the multiple perspectives that can be brought to bear on a particular problem, and to arrive at self-chosen positions to which they can commit themselves, while realizing the basis of other views with which they may disagree” (Cunningham, 1991, p. 14). Even though the emphasis is on learner construction, the instructional designer/ teacher’s role is still critical (Reigeluth, 1989). Here the tasks of the designer are two-fold: (1) to instruct the student on how to construct meaning, as well as how to effectively monitor, evaluate, and update those constructions; and (2) to align and design experiences for the learner so that authentic, relevant contexts can be experienced. Although constructivist approaches are used quite frequently in the preparation of lawyers, doctors, architects, and businessmen through the use of apprenticeships and on-the-job training, they are typically not applied in the educational arena (Resnick, 1987). If they were, however, a student placed in the hands of a constructivist would likely be immersed in an “apprenticeship” experience. For example, a novice instructional design student who desires to learn about needs assessment would be placed in a situation that requires such an assessment to be completed. Through the modeling and coaching of experts involved in authentic cases, the novice designer would experience the process embedded in the true context of an actual problem situation. Over time, several additional situations would be experienced by the student, all requiring similar needs assessment abilities. Each experience would serve to build on and adapt that which has been previously experienced and constructed. As the student gained more confidence and experience, (s)he would move into a collaborative phase of learning where discussion becomes crucial. By talking with others (peers, advanced students, professors, and designers), students become better able to articulate their own understandings of the needs assessment process. As they uncover their naive theories, they begin to see such activities in a new light, which guides them towards conceptual reframing (learning). Students gain familiarity with analysis and action in complex situations and consequently begin to expand their horizons: they encounter relevant books, attend conferences and seminars, discuss issues with other students, and use their knowledge to interpret numerous situations around them (not only related to specific design issues). Not only have the learners been involved in different types of learning as they moved from being novices to “budding experts,” but the nature of the learning process has changed as well. It is apparent that students exposed to the three instructional approaches described in the examples above would gain different competencies. This leads instructors/designers to ask two significant questions: Is there a single “best” approach and is one approach more efficient than the others? Given that learning is a complex, drawn-out process that seems to be strongly influenced by one’s prior knowledge, perhaps the best answer to these questions is “it depends.” Because learning is influenced by many factors from many sources, the learning process itself is constantly changing, both in nature and diversity, as it progresses (Shuell, 1990). What might be most effective for novice learners encountering a complex body of knowledge for the first time, would not be effective, efficient or stimulating for a learner who is more familiar with the content. Typically, one does not teach facts the same way that concepts or problem-solving are taught; likewise, one teaches differently depending on the proficiency level of the learners involved. Both the instructional strategies employed and the content addressed (in both depth and breadth) would vary based on the level of the learners. So how does a designer facilitate a proper match between learner, content, and strategies? Consider, first of all, how learners’ knowledge changes as they become more familiar with a given content. As people acquire more experience with a given content, they progress along a low-to-high knowledge continuum from 1) being able to recognize and apply the standard rules, facts, and operations of a profession (knowing what), to 2) thinking like a professional to extrapolate from these general rules to particular, problematic cases (knowing how), to 3) developing and testing new forms of understanding and actions when familiar categories and ways of thinking fail (reflection-in-action) (Schon, 1987). In a sense, the points along this continuum mirror the points of the learning theory continuum described earlier. Depending on where the learners “sit” on the continuum in terms of the development of their professional knowledge (knowing what vs. knowing how vs. reflection-in-action), the most appropriate instructional approach for advancing the learners’ knowledge at that particular level would be the one advocated by the theory that corresponds to that point on the continuum. That is, a behavioral approach can effectively facilitate mastery of the content of a profession (knowing what); cognitive strategies are useful in teaching problem-solving tactics where defined facts and rules are applied in unfamiliar situations (knowing how); and constructivist strategies are especially suited to dealing with ill-defined problems through reflection-in-action. A second consideration depends upon the requirements of the task to be learned. Based on the level of cognitive processing required, strategies from different theoretical perspectives may be needed. For example, tasks requiring a low degree of processing (e.g., basic paired associations, discriminations, rote memorization) seem to be facilitated by strategies most frequently associated with a behavioral outlook (e.g., stimulus-response, contiguity of feedback/reinforcement). Tasks requiring an increased level of processing (e.g., classifications, rule or procedural executions) are primarily associated with strategies having a stronger cognitive emphasis (e.g., schematic organization, analogical reasoning, algorithmic problem solving). 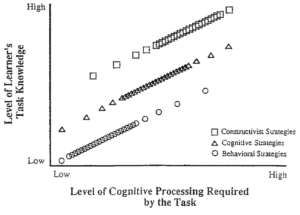 Tasks demanding high levels of processing (e.g., heuristic problem solving, personal selection and monitoring of cognitive strategies) are frequently best learned with strategies advanced by the constructivist perspective (e.g., situated learning, cognitive apprenticeships, social negotiation). We believe that the critical question instructional designers must ask is not “Which is the best theory?” but “Which theory is the most effective in fostering mastery of specific tasks by specific learners?” Prior to strategy(ies) selection, consideration must be made of both the learners and the task. An attempt is made in Figure 1 to depict these two continua (learners’ level of knowledge and cognitive processing demands) and to illustrate the degree to which strategies offered by each of the theoretical perspectives appear applicable. The figure is useful in demonstrating: (a) that the strategies promoted by the different perspectives overlap in certain instances (i.e., one strategy may be relevant for each of the different perspectives, given the proper amount of prior knowledge and the corresponding amount of cognitive processing), and (b) that strategies are concentrated along different points of the continua due to the unique focus of each of the learning theories. This means that when integrating any strategies into the instructional design process, the nature of the learning task (i.e., the level of cognitive processing required) and the proficiency level of the learners involved must both be considered before selecting one approach over another. Depending on the demands of the task and where the learners are in terms of the content to be delivered/discovered, different strategies based on different theories appear to be necessary. Powerful frameworks for instruction have been developed by designers inspired by each of these perspectives. In fact, successful instructional practices have features that are supported by virtually all three perspectives (e.g., active participation and interaction, practice and feedback). Figure 1. Comparison of the associated instructional strategies of the behavioral, cognitive, and constructivist viewpoints based on the learner’s level of task knowledge and the level of cognitive processing required by the task. For this reason, we have consciously chosen not to advocate one theory over the others, but to stress instead the usefulness of being well versed in each. This is not to suggest that one should work without a theory, but rather that one must be able to intelligently choose, on the basis of information gathered about the learners’ present level of competence and the type of learning task, the appropriate methods for achieving optimal instructional outcomes in that situation. As stated by Smith and Ragan (1993, p. viii): “Reasoned and validated theoretical eclecticism has been a key strength of our field because no single theoretical base provides complete prescriptive principles for the entire design process.” Some of the most crucial design tasks involve being able to decide which strategy to use, for what content, for which students, and at what point during the instruction. Knowledge of this sort is an example of conditional knowledge, where “thinking like” a designer becomes a necessary competency. It should be noted however, that to be an eclectic, one must know a lot, not a little, about the theories being combined. A thorough understanding of the learning theories presented above seems to be essential for professional designers who must constantly make decisions for which no design model provides precise rules. Being knowledgeable about each of these theories provides designers with the flexibility needed to be spontaneous and creative when a first attempt doesn’t work or when they find themselves limited by time, budget, and/or personnel constraints. The practitioner cannot afford to ignore any theories that might provide practical implications. Given the myriad of potential design situations, the designer’s “best” approach may not ever be identical to any previous approach, but will truly “depend upon the context.” This type of instructional “cherry-picking” has been termed “systematic eclecticism” and has had a great deal of support in the instructional design literature (Snelbecker, 1989). In closing, we would like to expand on a quote by P. B. Drucker, (cited in Snelbecker, 1983): “These old controversies have been phonies all along. We need the behaviorist’s triad of practice/reinforcement/feedback to enlarge learning and memory. We need purpose, decision, values, understanding–the cognitive categories–lest learning be mere behavioral activities rather than action” (p. 203). And to this we would add that we also need adaptive learners who are able to function well when optimal conditions do not exist, when situations are unpredictable and task demands change, when the problems are messy and ill-formed and the solutions depend on inventiveness, improvisation, discussion, and social negotiation. Bednar, A. K., Cunningham, D., Duffy, T. M., & Perry, J. D. (1991). Theory into practice: How do we link? In G. J. Anglin (Ed. ), Instructional technology: Past, present, and future. Englewood, CO: Libraries Unlimited. Bower, G. H., & Hilgard, E. R. (1981). Theories of learning (5th ed.). Englewood Cliffs, NJ: Prentice-Hall. Bruner, J. S. (1971). The process of education revisited. Phi Delta Kappan, 53,18-21. Clancey, W. J. (1986). Review of Winograd and Flores’ understanding computers and cognition: A favorable interpretation. (STAN-CS-87-1173) Palo Alto, CA: Department of Computer Science, Stanford University. Cunningham, D. J. (1991). Assessing constructions and constructing assessments: A dialogue. Educational Technology, 31(5), 13-17. Duffy, T. M., & Jonassen, D. (1991). Constructivism: New implications for instructional technology? Educational Technology, 31(5), 3-12. Gropper, G. L. (1987). A lesson based on a behavioral approach to instructional design. In C. M. Reigeluth (Ed. ), Instructional theories in action (pp. 45-112). Hillsdale, NJ: Lawrence Erlbaum Associates. Hulse, S. H., Egeth, H., & Deese, J. (1980). The psychology of learning (5th ed.). New York: McGraw-Hill. Johnson, J. K. (1992). Advancing by degrees: Trends in master’s and doctoral programs in educational communications and technology. Tech Trends, 37(2),13-16. Jonassen, D. H. (1991a). Evaluating constructivistic learning. Educational Technology, 31(9), 28-33. Jonassen, D. H. (1991b), Objectivism vs constructivism: Do we need a new philosophical paradigm. Educational Technology Research and Development, 39(3), 5-14. Keller, J. M. (1979). Motivation and instructional design: A theoretical perspective. Journal of Instructional Development, 2(4), 26-34. Lynch, J. M. (1945). The applicability of psychological research to education. Journal of Educational Psychology, 43, 289-296. Merrill, M. D., Kowalis, T., & Wilson, B. G. (1981). Instructional design in transition. In F. H. Farley, & N. J. Gordon (Eds. ), Psychology and education: The state of the union (pp. 298-348). Berkeley: McCutchan. Perkins, D. N. (1991). Technology meets constructivism: Do they make a marriage? Educational Technology, 31(5), 18-23. Reigeluth, C.M. (1983). Instructional Design: What is it and why is it? In C. M.
Reigeluth (Ed. ), Instructional theories in action (pp. 3-36). Hillsdale, NJ: Lawrence Erlbaum Associates. Reigeluth, C. M. (1989). Educational technology at the crossroads: New mindsets and new directions. Educational Technology Research and Development, 37(1), 67-80. Resnick, L. B. (1987). Learning in school and out. Educational Researcher, 16(9), 13-20. Richey, R. D. (1986). The theoretical and conceptual bases of instructional design. New York: Nichols. Schunk, D. H. (1991). Learning theories: An educational perspective. New York: Macmillan. Shuell, T. J. (1990). Phases of meaningful learning. Review of Educational Research, 60, 531-547. Smith, P. L., & Ragan, T. J. (1993). Instructional design. New York: Macmillan. Schon, D. A. (1987). Educating the reflective practitioner. San Francisco: Jossey-Bass. Snelbecker, G. E. (1983). Learning theory, instructional theory, and psychoeducational design. New York: McGraw-Hill. Snelbecker, G. E. (1989). Contrasting and complementary approaches to instructional design. In C. M. Reigeluth (Ed. ), Instructional theories in action (pp, 321-337). Hillsdale, NJ: Lawrence Erlbaum Associates. Spiro, R. J., Feltovich, P. J., Jacobson, M. J., & Coulson, R. L. (1991). Cognitive flexibility, constructivism, and hypertext: Random access instruction for advanced knowledge acquisition in ill-structured domains. Educational Technology, 31(5), 24-33. Stepich, D. A., & Newby, T. J. (1988). Analogical instruction within the information processing paradigm: Effective means to facilitate learning. Instructional Science, 17, 129-144. Thompson, A. D., Simonson, M. R., Hargrave, C. P. (1992). Educational technology: A review of the research. Washington DC: Association for Educational Communications and Technology. Tyler, R. W. (1978). How schools utilize educational research and development. In R. Glaser (Ed. ), Research and development and school change. Hillsdale, NJ: Lawrence Erlbaum. Warries, E. (1990). Theory and the systematic design of instruction. In S. Dijkstra, B. van Hout Wolters, & P. C. van der Sijde, (Eds. ), Research on instruction: Design and effects (pp. 1-19). Englewood Cliffs, NJ: Educational Technology. West, C. K., Farmer, J. A., & Wolff, P. M. (1991). Instructional design: Implications from cognitive science. Englewood Cliffs, NJ: Prentice Hall. Winn, W. (1991). The assumptions of constructivism and instructional design. Educational Technology, 31(9), 38-40. Winn, W. (1990). Some implications of cognitive theory for instructional design. Instructional Science, 19, 53-69. Winne, P. H. (1985). Cognitive processing in the classroom. In T. Husen & T. N. Postlethwaite (Eds. ), The International Encyclopedia of Education (Vol. 2, pp. 795-808). Oxford: Pergamon. An update was published in Performance Improvement Quarterly in 2013 by the authors to accompany the 30 year anniversary and republication of the original article. This update adds a strong second part to this article, and you are encouraged to read it here [https://edtechbooks.org/-BQ]. How would the instruction be designed differently by a behaviorist, a cognitivist, and a constructivist? Scenario: A high school social study teacher is planning a class on the Vietnam War. Describe an example from your life of when you were taught using each method described in this article: behaviorism, cognitivism, and constructivism. Based on your reading, would you consider your current instruction style more behavioralist, cognitivist, or constructivist? Elaborate with your specific mindset and examples. 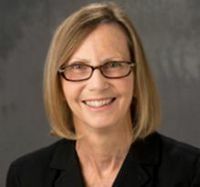 Dr. Pegger A. Ertmer served as a professor of Curriculum & Instruction in Educational Technology at Purdue University. She focuses on the impact that student-centered instructional approaches and strategies have on learning. She is also the founding editor of the Interdisciplinary Journal of Problem-Based Learning. Dr. Ertmer received her PhD in Curriculum & Instruction from Purdue University. Dr. Timothy Newby is a professor in the Department of Curriculum and Instruction at Purdue University. He received his Phd in Instructional Psychology from Brigham Young University. Professor Newby’s research focuses on learning and motivation and the impact of various instructional strategies. 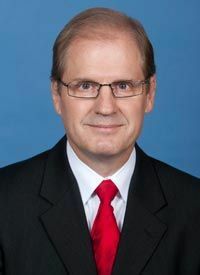 In particular he has studied the creation and implementation of instructional analogies, the use of mentoring, and the integration of computer technology.